I love writing cookbooks almost as much as I love to eat! My favorite thing is to create easy, healing foods and share them with you! “A good breakfast has long been touted as the secret to a great day. But if you’re following a Paleo diet, traditional favorites like English muffins, yogurt, oatmeal, toast with jam, or treats like pancakes, waffles, and blueberry muffins are off the menu. 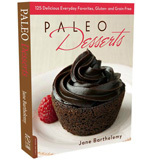 Now, Jane Barthelemy, the author of Paleo Desserts, has whipped up 165 healthy, luscious, low-carb replacements free of gluten, grain, dairy, and refined sugar. Created to give you greater energy without hunger pangs, feelings of deprivation, or a crash later in the day, these recipes are nutrient-dense and free of the sugar and chemicals that trigger cravings and weight gain. You’ll find everything from homemade staple ingredients, such as non-dairy milks and nut butters, to grain-free breads, cereals, muffins, as well as smoothies, egg- and meat- based hearty breakfasts, and grab-n-go goodies, all made with real foods: fresh vegetables, tart fruits, unprocessed meats, nuts, eggs, and unrefined oils. 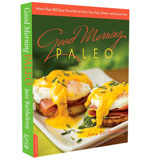 With dairy-free, egg-free, tree-nut free, and meat-free, options, as well as recipes that work with diabetic and anti-candida diets, Good Morning Paleo will give you healthy, nutritious fuel to keep you going strong throughout your day.